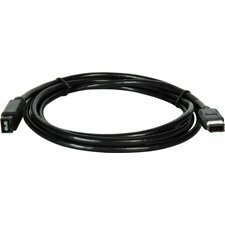 15ft 9-Pin to 6-Pin Firewire Cable-by-Unique Product Solutions by Unique Product Solutions at Pacs BG. MPN: FWC-9-6-15. Hurry! Limited time offer. Offer valid only while supplies last. Data transfer speeds up to 800 Mbps. Distances up to 100 meters without repeaters. Plug-and-play connectivity. Highly efficient architecture. Not only is FireWire 800 twice as fast as before, but it can be used over much longer distances. The 1394b specification allows the use of various types of cabling, each offering different speed/distance capabilities. FireWire 800 (1394b) hubs even make it possible to connect FireWire 400 (1394a) devices. Neither the computer nor the remote devices need to support FireWire 800, because the new hubs and their associated cables work with FireWire 400 equipment. New FireWire 800 (and other 1394b) devices can, of course, communicate over long connections directly through their own FireWire 800 ports; no hub is required to gain this distance benefit in a FireWire 800 connection. If you have any questions about this product by Unique Product Solutions, contact us by completing and submitting the form below. If you are looking for a specif part number, please include it with your message.